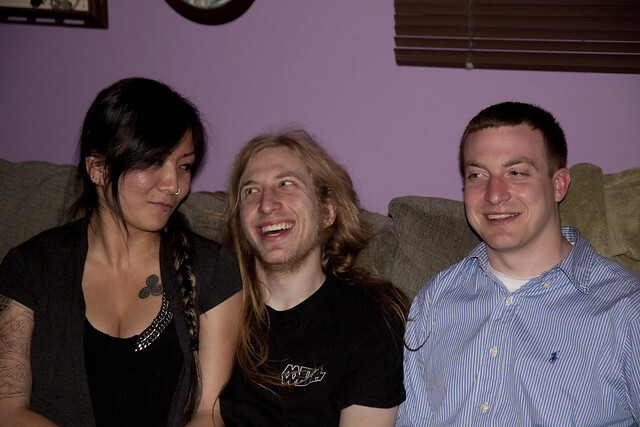 Sunday was Mother's Day and I was deliciously spoiled by my sons Jeffrey and Alex, and by Alex's girlfriend, Veronica. My younger son, Alex and his lovely girlfriend, Veronica gave me a delicious fruit bouquet, which arrived early that morning. Alex had to work all day and Veronica spent the day with her family so it was just Jeffrey and me until the evening. He spoiled me with brunch and a pretty pot of pansies (say that three times fast!). Later, the four of us spent a quiet evening together. Jeffrey is now on his way to Cold Lake, Alberta where he'll likely spend the next four years working as an air traffic and air weapons controller for our Canadian military. I miss him, already. Below are a few photos from Sunday. How about now? 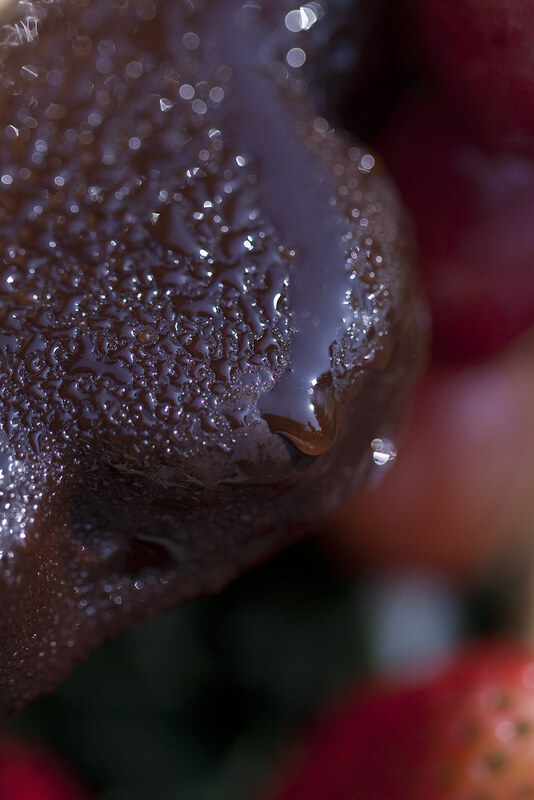 This is a closeup of the chocolate-dipped pineapple, dripping with condensation. If you look closely, you can see my son, Jeffrey in the reflection of the droplet. And here are my two boys. There's a bit of a contrast between these two brothers, wouldn't you say? Veronica, Alex (the perpetual goof) and Jeffrey - thank you all for a most lovely Mother's Day. Oh Hilary, what a beautiful family you have! And yes, I was drooling at the sweets. Yum x1000! A belated Mother's Day wish for you. Interesting how different our children can be. I'd like some of that fruit. 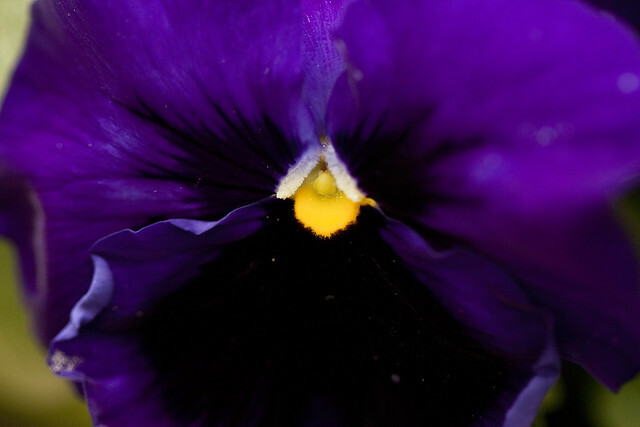 And I love pansies. The rich colors are my favorite. I'm wondering just how young you must have been when your two lads came into this world. 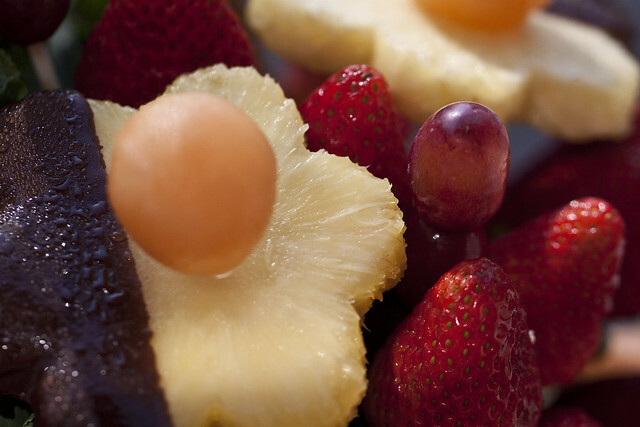 Fresh fruit dipped in chocolate... does it get any better? Well it does when family gathers and shares the lov'in. Thanks. I love learning about new blogs. Lovely captures of the occasion. There is definitely a bit of a contrast between these two boys. Has that contrast always been so evident, or did it just show up as they matured? 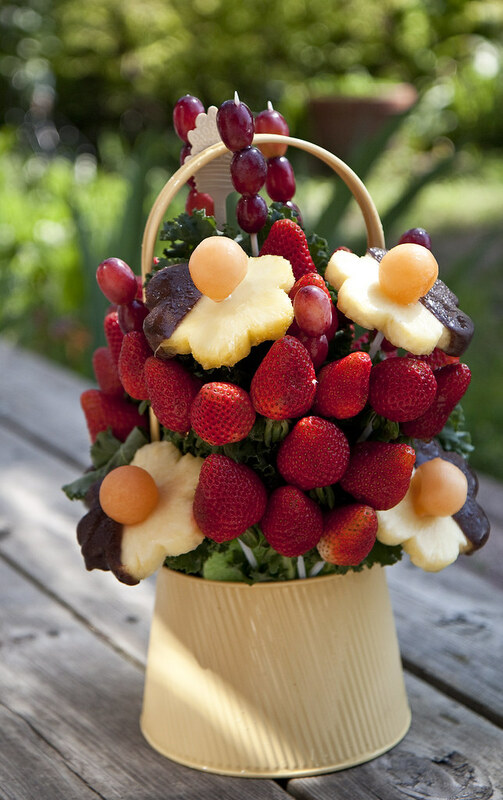 The fruit bouquet is beautiful, and what a great idea for a gift! Way to go, Veronica and Alex. oh my, hilary! thank you so much. i am honoured!!! i do really appreciate it! that close-up of the chocolate-dipped pineapple is truly EXQUISITE! ...and yes i'm drooling over this! I think if fruit looked like that all the time our kids would kill for it! awww i am glad you had a great mothers day...fruit bouquets are yummy! smiles....and congrats tot he POTW! A mom and her sons, what mother's day was made for! It looks like yours was terrific! Yes, our children can be oh so alike and oh so different all at the same time. Keeps things interesting. Love the photos, and the fruit looks divine. That edible bouquet looks most yummy. I'm glad you had a lovely day! HIlary- Sounds like you had a wonderful Mother's Day! Handsome young men your boys are. And sweet, too. The colors here today are pure saturated yumminess! Haven't yet had my breakfast, and now I know exactly what I want--only I'm going to have to run out to the market's produce section! thanks for doing the POTW. the first link doesn't work, however. Glad you had a lovely time with your sons on Mothers Day. No,they are not very alike to look at! Thats how it goes sometimes.Both precious in their own way. your boys may be worlds apart but you can definitely see the family resemblance. Happy mother's day. Lovely post. Glad you have been so spoiled by your family. Love Alex's hair btw! That is one great Mother's Day gift! So nice to meet your sons. Love to come and check out your Posts of the week. Although your sons are "a bit" different, they love you and you're a happy mother! Looks like you were treated most royally by your boys, and Veronica ~ what a delicious looking fruit bouquet, very droolworthy. I wish your son well in his new job and location. How did you know I was drooling over that fruit boquet? It sounds like you had an amazing Mother's day. Yes, there is a contrast between your two boys but both are very handsome. When I was young and in high school, I always liked the boys with long hair. A really fancy artistic fruit bouquet. It's great that adult children will remember and celebrate Mothers' day a bit. Now for your son coming to Alberta...God's country! He'll never go back. He's going to a very beautiful area. It's a bit remote but still easily within reach of Edmonton. Had a friend's son who spent 10 years there and now his folks have retired there. Sounds like a great Mother's Day! I love those edible arrangements..I don't know where they get their fruit but it's always perfection. I've sent a few and I think they are so fun. I love the different personalities of your boys. Isn't it funny how kiddos from the same Momma can be so different? I have 4 sons so I should know! Thanks for sharing your day with us and thanks for making me wish I had chocolate covered fruit right now! That fruit bouquet seems other worldly, and I like the bokeh in the background. Happy Mother's Day! What great surprises. Your boys have beautiful smiles. I am glad you were spoiled. Those treats do look delicious. It's wonderful to have family around for Mothers' Day. What a day, spoiled by both your boys, fabulous. Thanks for posts of the week, what fun. So many of us love your smashing photos and blog-pics! There might be a contrast between those boys but they sure do love their mamma. Yummy yum, too much, too fruity and I love it, yummy. I like the hair of your second son, fantastic. 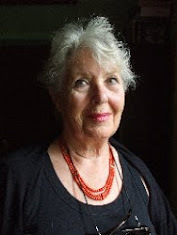 Thanks Hilary for the POTW. Oh that fruit looks just divine, awesome photographs! So nice to spend the day with your boys... looks a fun day. Happy belated Mother's Day!! 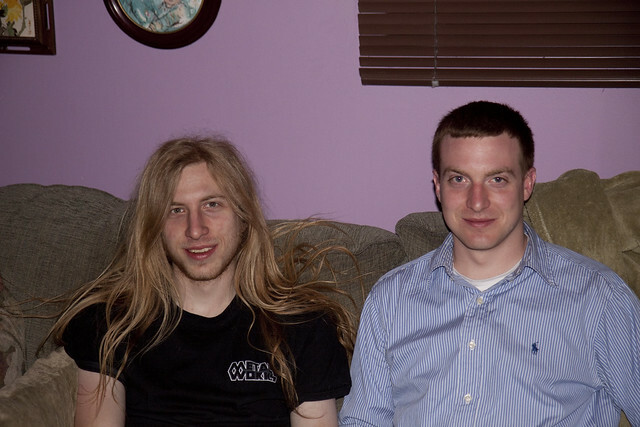 Great looking sons, and isn't it wonderful how your kids can be so unique? why yes, i AM drooling!